Our program was designed in partnership with local industry to teach you the exact skills you need to get a great job. We’ll even help you find that job. 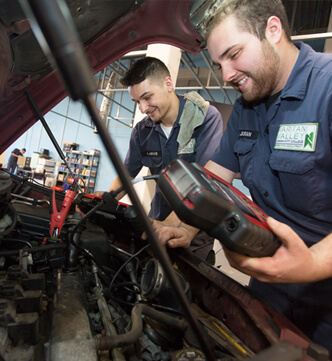 Our hands-on full-time program is geared toward turning you into an Automotive Technician employers are eager to hire. The Automotive Technology program is a hands-on, competency-based program to provide you with the knowledge and skills that employers expect. RVCC is committed to match your job placement needs at the end of training program for you to be successful in the automotive industry while fulfilling your passion. The program mirrors a real-world workplace so you can learn in an actual shop environment. All program standards have been set to match the performance expectations of current automotive technicians working in this field. Students have the opportunity to develop diagnostic and mechanical competency in the automotive field. The program supports the National Institute for Automotive Service Excellence (ASE) Certified Automobile Technician Training Program standards. Graduates of the Automotive Technology program will be prepared to complete ASE exams and can substitute their training for one year of the two years of work experience required to become ASE Certified. 1-year Certificate Track (36-37 credits) – Prepare for an entry-level technician position. All classes college credit worthy. RVCC has partnered with manufacturers to bring a higher level of industry certifications to the Automotive Technology progra. Mopar CAP Local specialized certification track to become a Chrysler Certified Technician at the second level of technician training status. Subaru University specialized certification track to become a Subaru Certified Technician at the second level of technician training status. Once you are trained, we’ll help you find the job that works for you. The program is eligible for federal and state student financial aid. The Certificate in Automotive Technology prepares students for entry into the automotive service field as technicians. Graduates are qualified for various technical level positions in manufacturing or developmental laboratories, diagnostic centers, specialized repair shops and sales. Graduates are also prepared for self-employment. This certificate is designed for students to complete in one year, if they begin in the fall semester. Instruction in the program includes fuel systems, electrical systems, analysis of engines, suspension systems and wheel alignment. Students have the opportunity to develop diagnostic and mechanical competency in the automotive field. Courses in this certificate prepare students to take the Automotive Service Excellence (ASE) certification test. Prerequisite(s): Placement into MATH 020 Elementary Algebra and ENGL 060 Introduction to College Reading and Composition II. This course will provide an overview of basic theory and functions of all automotive systems. This course will also introduce students to automotive industry standard practices including shop safety, use of chemicals, documenting repair estimates and work orders, identifying careers in the auto industry, and learning employability skills. Upon completion of this course, the student will be familiar with the tools, service procedures, and safety customary to the automotive field. This course will prepare students for OSHA 10 hour certifications in general industry safety. In the lab, students will learn a hands-on strategy using different types of lifting equipment, perform basic maintenance of the shop, and learn how to use a variety of hand tools, power tools, and precision measurement tools. Students will be required to wear clothing appropriate for auto shop safety at all classes. Safety glasses will also be required at all classes. Corequisite(s): AUTC 101 Automotive Introduction, Fundamentals, and Safety. In the lab, students will learn a hands-on strategy to perform basic maintenance of braking systems and learn how to use a variety of hand tools and diagnostic tools and processes. Students will be required to wear clothing appropriate for auto shop safety at all classes. Safety glasses will also be required at all classes. Principles of electricity, circuitry and service are included in this course. It will cover batteries, starting and charging systems, lighting and accessory systems as well as laws relating to power and consumption of electricity including Kirchhoff’s Law, Ohm’s Law, and Watt’s Law. Skills in trouble-shooting the automotive electrical system will be developed with the use of modern testing and service equipment. In the lab, students will learn a hands-on strategy to perform basic maintenance of engines and learn how to use a variety of hand tools and precision measurement tools. Students will be required to wear clothing appropriate for auto shop safety at all classes. Safety glasses will also be required at all classes. This course will cover the theoretical understanding of principles, maintenance and adjustments required to today’s automatic transmissions, transaxles, drive shafts, final drives and all-wheel drive units. Prerequisite(s): Grade of A in ENGL 050 Introduction to College Reading and Composition I or ENGL 060 Introduction to College Reading and Composition II, grade of B in ENGL 050 or ENGL 060 with corequisite of ENGL 070 English Composition I Workshop, or appropriate score on placement test. This course will include a study of theories and practice of various automotive engine systems with respect to theory and operation of the internal combustible engine, the OTTO cycle, lubricating system, and coolant system. Training is provided in diagnosing, repairing, and theory of the following subsystems: cylinder block, cylinder heads, and intake and exhaust systems with emphasis on emission control systems. This course will cover the theory involved in front and rear suspension, steering geometric angles, weight distribution, wheel balancing and alignment. Practice is provided in diagnosing and servicing these systems of an automobile. In the lab, students will learn a hands-on strategy to perform basic maintenance of steering and suspension systems and learn how to use a variety of hand tools and precision measurement tools. Students will be required to wear clothing appropriate for auto shop safety at all classes. Safety glasses will also be required at all classes. This course includes a study of cooling, heating, defrosting and air conditioning systems. Maintenance, diagnosis and repair of the systems are covered using lecture and lab experiences. Electrical and/or vacuum circuits and controls are emphasized. In the lab, students will learn a hands-on strategy to perform basic maintenance of engines and learn how to use a variety of diagnostic and appropriate tools. Students will be required to wear clothing appropriate for auto shop safety at all classes. Safety glasses will also be required at all classes. Prerequisite(s): AUTC 101 Automotive Introduction, Fundamentals, and Safety, AUTC 201 Engine Systems & Emission Control, AUTC 104 Automotive Electrical Systems. This course will include a study of theories and practice of various automotive engine control systems. The course will build diagnostic skills related to troubleshooting engine computer systems. The use of up-to-date testing equipment, including the scan tool and lab scope are used in checking the electrical, ignition, emissions system, and general engine conditions. Fundamental principles and types of clutches and manual transmissions and their component parts are covered. Students will experience the installation and adjustment of clutches, manual transmissions, universal parts and other components such as drive shafts. Diagnosis and service of standard transmissions are included. In the lab, students will learn a hands-on strategy to perform basic maintenance of manual transmissions, clutches, and drive train and learn how to use a variety of hand tools and precision measurement tools. Students will be required to wear clothing appropriate for auto shop safety at all classes. Safety glasses will also be required at all classes. The Associate of Applied Science degree in Automotive Technology prepares students for entry into the automotive service field as technicians or managers. Graduates are typically qualified for entry-level positions at new-car dealerships, independent repair shops, or franchise service centers. Graduates are also prepared for self-employment. Instruction in the program includes engines, fuel and ignition systems, electronics, brakes, transmissions, steering, and suspensions systems. Training is conducted by a combination of class lecture and practical shop work, so that students can develop diagnostic and mechanical competencies. Courses in this degree prepare students to take the Automotive Service Excellence (ASE) certification tests. Students who have completed the Automotive Technology courses as part of the Certificate in Automotive Technology Program have the option to transfer credits from completed classes into the AAS degree program. Prerequisite(s): A grade of C or higher in AUTC 104 Automotive Electrical Systems I . Advanced theory of electrical circuitry, magnetism, induction, and computer control circuits and functionality are included in this course. The course will cover advanced starting and charging strategies controlled by the engine control module, advanced lighting and accessory systems as well as improving skills in laws relating to power and consumption of electricity. Skills in trouble-shooting the automotive electrical system will be further developed with the use of advanced testing equipment. In the lab, students will learn a hands-on strategy to perform advanced diagnostic strategies and learn how to use a variety of diagnostic tools and electronic equipment. Students will be required to wear clothing appropriate for auto shop safety at all classes. Safety glasses will also be required at all classes. Prerequisite(s): A grade of C or higher in AUTC 202 Engine Performance and Diagnosis I . This course includes a study of theories and practice of various automotive engine control systems. The course will improve previously acquired diagnostic skills related to troubleshooting engine computer data and networking systems. The use of up-to-date testing equipment, including the scan tool and lab scope are used in checking the electrical, ignition, emissions system, and CAN Bus network. In the lab, students will learn a hands-on strategy to perform basic maintenance of engines and learn how to use a variety of hand tools and diagnostic tools. Students will be required to wear clothing appropriate for auto shop safety at all classes. Safety glasses will also be required at all classes. Prerequisite(s): A grade of C or better in AUTC 203 Steering & Suspension Systems I . This course will cover the theory involved in advanced Steering and Suspension Systems including diagnosing alignment, tire wear, and Stability Control System problems. The alignment angles and procedures will prepare students to diagnose tire wear and road tracking issues to complete necessary alignment adjustments to vehicles. Practice is provided in diagnosing and servicing these systems as well as performing the alignment adjustments to correct the tire wear and pull of an automobile. In the lab, students will perform diagnostic strategies of steering angles and alignments and learn how to use a variety of diagnostic tools, hand tools, and precision measurement tools. Students will be required to wear clothing appropriate for auto shop safety at all classes. Safety glasses will also be required at all classes. Prerequisite(s): MATH 020 Elementary Algebra , MATH 020W Elementary Algebra with Workshop or appropriate score on placement test. This course is a survey of concepts, principles, theories, and practices of Interpersonal Communication. Students will participate in small-group and large-group experimental learning simulations that reinforce theory and practice of effective Interpersonal Communication. Emphasis is on self-awareness as the key to awareness of others. Topics covered include listening, self-esteem, self-disclosure, interpersonal dynamics, and assertiveness training. Students who complete this course will become more effective and confident in their relationships with family, friends, colleagues, significant others, and strangers. Prerequisite(s): ENGL 111 English Composition I . Organizational and Technical Communication is an introduction to writing and oral communication in business, professional, and technical settings. Students will produce and analyze common communication genres including written emails, letters, resumes, memos, proposals, reports, technical definitions, and technical manuals, and, oral phone calls, meetings, and presentations. Prerequisite(s): MATH 020 Elementary Algebra or satisfactory score on the placement test. This course provides a broad introduction to energy and energy issues as they relate to generation options, utilization and environmental impacts. Topics include overviews of traditional carbon based energy sources, nuclear options and alternative energy technologies such as solar, wind, biofuels and hydrogen. The crucial link between energy and climate change will be examined. The environmental consequences of energy choices on local and global scales will be discussed and integrated throughout the course. Topics will be evaluated by applying basic scientific principles and the scientific method to real world problems. Policy options and understanding energy in a societal context will also be explored. Prerequisite(s): A grde of C or better in AUTC 201 Engine Systems & Emission Control I . This course will build on the theory and practice of advanced operation of the internal combustible engine, the OTTO cycle, lubricating systems, and coolant systems. Training is provided in diagnosing, repairing, and theory of the following subsystems: cylinder block, cylinder heads, and intake and exhaust systems with emphasis on emission control systems. Prerequisite(s): A grade of C or better in courses AUTC 102 Automotive Brake Systems and AUTC 203 Steering & Suspension Systems I . This course will cover the theory involved in advanced suspension and steering diagnosis and Anti-Lock Brake systems. These two systems work in conjunction with each other for advanced safety systems including traction control and anti-roll stability controls. Practice is provided in diagnosing and servicing these systems of an automobile. 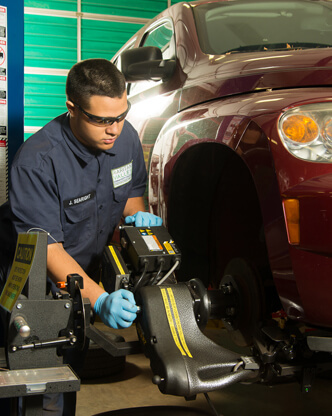 In the lab, students will learn a hands-on strategy to perform advanced diagnostic strategies of steering, suspension, and anti-lock brakes systems and learn how to use a variety of diagnostic tools, hand tools, and precision measurement tools. Students will be required to wear clothing appropriate for auto shop safety at all classes. Safety glasses will also be required at all classes. Prerequisite(s): MATH 030 - Intermediate Algebra or MATH 106 Technical Math . In this course, students will examine the development of scientific theories, and discuss how science is viewed by the public through various forms of media sources. The use of the scientific method to conduct research and experiments will encourage students to distinguish credible science from false scientific claims. The importance to society of scientists and citizens making informed decisions on science/technology issues are stressed. Select from the appropriate cataegory of the General Education List. Suggested courses are PHIL 113 - Critical Thinking or PHIL 114 - Ethics. Students wishing to transfer to Penn College of Technology should consider taking ECON 101 - Macroeconomics. Start living your dreams today.